The new Super League season will be officially launched today – with Kris Radlinski declaring Wigan “look like a team of challengers”. Adrian Lam will join the other top-flight coaches at Old Trafford for a media event ahead of the new campaign, which starts a week today when Warriors travel to St Helens. Warriors executive director Radlinski believes it is easier for players to “hit the snooze button” during pre-season when they are wearing a winner’s ring. But having monitored training at close range, he is in optimistic mood it will be another successful season. 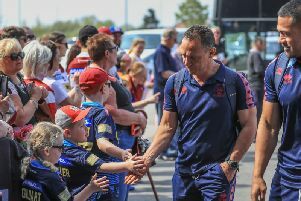 He said: “From what I’ve seen from the boys at the minute is that they’ve returned for pre-season training very motivated and to me, they don’t look like a team of champions – they look like a team of challengers. “That means they are hungry, and I’m excited by that so I’m pretty optimistic for the season ahead. “We’ve never gone back-to-back in the Super League era, and that’s something we’ve spoken about. Of course, not all of Lam’s players savoured winning a Grand Final last year, with three new arrivals – Joe Bullock, Jarrod Sammut and Zak Hardaker – on board. Hardaker has inevitably attracted the greater focus given his profile, and the fact he is returning from a doping ban that wiped out his 2018 campaign. “He can become a success here, and we wouldn’t have signed him if we thought otherwise,” said Radlinski. Hardaker was late joining Wigan for pre-season as he underwent rehab at the Sporting Chance clinic, after being banned for drink-driving. Radlinski added: “He’s had some issues, we’ve worked hard with him off-the field and he’s got himself into a place where he’s ready to showcase his talent to Super League again and we’ll be supporting him in that. “It’s early days, let’s be clear. He’s had to go through a process where he’s had to strip himself back down and open himself up, and that’s very difficult to do and the feedback that we got from people in the facility is that he was excellent to work with.